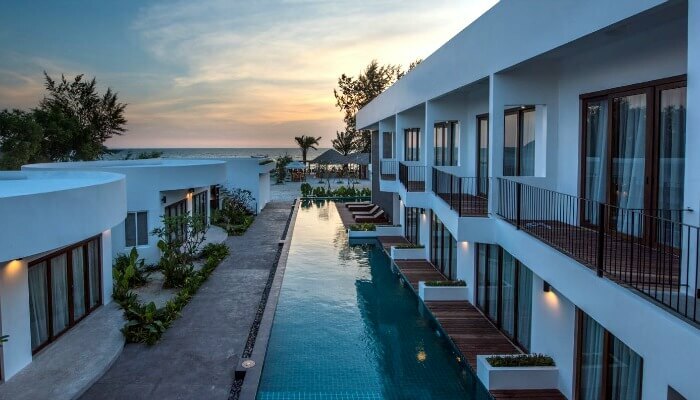 Cambodia may not have quite the range of large-scale luxury resorts that you can find in neighbouring Thailand and Vietnam but it does have a remarkable range of gorgeous little boutique hotels that are perfect for families. Some may be relatively low-key with just a series of rooms ranged around a small but immaculate garden with a lovely little pool. These have the added attraction that you can put younger children to bed and sit outside somewhere nearby for an evening drink. Others are much more sophisticated and there are a couple of award-winning hotels in Siem Reap, which are exquisitely and imaginatively decorated, combining Khmer style with 5-star luxury. The majority of hotels will have a pool. This is a great bonus as it is hot year round and the children will love being able to cool off in the water. What is a typical Cambodian hotel like? One of our favourite hotels in Cambodia is the Ren Resort, on the beach in Sihanoukhville. Much of this area is very over-developed and frankly best avoided but if you head south out of town you get to the immaculate slice of white sandy beach that is Otres. Keep on going past a smattering of beach-front cafes and you will find the Ren Resort, a small boutique resort that combines the best of Cambodian hospitality with a real eye for detail and design. Built around a pool, the hotel and grounds are all immaculate and rooms are tastefully decorated and wonderfully cool… a great respite from the heat! The restaurant is right on the beach so you can have your breakfast whilst you enjoy sublime views of the tiny off-shore islands. However, the star attraction of the Ren Resort are the staff whose commitment to guests is superb. They can arrange birthday cakes, suggest nearby restaurants, help arrange activities and generally just ensure that everything runs smoothly. This little boutique hotel just gets it so right! What are the different standards of hotels like in Cambodia? If you decide to head to the remote Cardamom Mountains and are travelling on a budget, or are just happy to go without your creature comforts for a day or two, look no further than the Rainbow Lodge. This eco-resort occupies an enchanting riverside position on the edge of the south Cardamom Mountains. Simple palm frond bungalows connected by bamboo walkways are dotted across the hillside each with a private balcony and dramatic views. You can spend your days kayaking through the mangroves in search of exotic birds and brightly coloured butterflies or perhaps walk to a nearby waterfall for a dip. You can try your hand at fishing, swim in the river or take a sunset river cruise in search of wildlife. This is a true haven in the middle of the jungle and a great place to recharge the batteries. If you would like a bit more comfort you could look at the 4 Rivers Floating Lodge, which is nearby. Again occupying a stunning position on the edge of the Tatai River, the lodge offers beautiful tented villas that float on the river. Wake up early to watch the morning mist clear over the surrounding virgin forest. Take a trekking tour into the jungle where the children will enjoy learning about the natural remedies that have been used by villagers for centuries. Or perhaps have a unique ‘hydro massage’ courtesy of the thundering waters of the nearby waterfall. At dusk it’s time for a drink on the porch outside your room, watching the bats dart down to drink from the water. Heaven! These are just a few examples of places to stay in Cambodia that past travellers have loved. All our holidays are tailor-made, so once we have found out a bit more about you and your family, we will suggest a range of properties that we think will suit you best. Get in touch for firsthand advice on family travel in Cambodia.